Okay before we get started here, I gotta let y’all know in advance this might be a long blog post! I had so much trouble deciding on favorite images to post + little snippets to tell, so see if you can bare with me here! On January 18th I had the infinite pleasure of documenting the wedding of Lance + Abi and ohmygosh it was so freaking sweet. About a year ago, I shot them up at Leo Carillo with their WOLFDOG and absolute sweetheart, Luna. Straight off the bat, the four of us (well, five of us - my husband, Krisz, came too!) got along so well. I loved capturing them during that insanely gorgeous golden hour, with the rolling hills behind them and their beautiful pup by their side. Then in December, I had organized a styled shoot but every model couple I’d set up seemed to fall through! So I asked Lance + Abi to step in for me and they were amazing. They’d gotten engaged just a few days prior, and on the way there my uber driver jokingly said “maybe they’ll enjoy this so much they’ll decide to get married even sooner!” I laughed + went on to my shoot, only for a few days to pass and Abi text me saying over the holidays they’d decided to move to Texas and that they’d be getting married in January! She said they’d love for me to photograph it for them and of course, I was totally up for it! Before their ceremony, we explored fun vignettes around City Hall (rooftop decks are a personal fave!) to get some variety in their couple portraits! I loved the motion of Abi’s dress, so I made sure to get shots of her playing with it and that breeze sweeping it up. It was uncharacteristically chilly that morning, so I told Lance to come in and warm up his bride with a few squeezes! I loved the urban feel of this shot! Putting it in black + white gave it a very nostalgic feel, and I thought the perspective between the walls was an interesting + unique view. I feel like I’ve done a disservice to this sweet Luna, Lance + Abi’s wolfdog/husky rescue by not showing her more here! She was a five-star bridesmaid and major comfort to the couple all day. She barely let them leave her sight! Documenting the prep/behind-the-scenes is something I love to do. These little moments, full of anticipation and emotions are so sweet and often overlooked. Showcasing these is just as important as the couple portraits for me! The city clerk brought the family to a small ceremony room in the back, where Lance + Abi exchanged rings and OFFICIALLY became a married couple! After their city hall ceremony, Lance + Abi brought their family back to L’Opera Ristorante in Long Beach, one of their favorite date night spots. As they were leaving for Texas just a few days after the ceremony, it was a great excuse to eat their favorite pasta one last time before their big move! We snuck away from our killer pasta and the reception brunch for a few moments to take some portraits of them enjoying the small-town Long Beach feel one last time. I loved how even though these have more of an urban backdrop, they still feel intimate + so emotional. Wishing many many trips around the sun together for these two and I can’t wait to go visit them (and sweet Luna) in Texas sometime! 3 things you can do to rock your engagement shoot! y'all - I get it! you're not professional models. here's a little secret: almost no one is! The number one mood killer in engagement shoots is bringing mannequin moves to the shoot. instead of staying stiff + static, keep moving! It doesn't have to be drastic. For instance, if I asked you to stand still and embrace each other, you could simply move your fingertips, sliding them just a little along your partner's neck/back/waist. Those simple gestures will keep you in the moment with your partner and make the moment feel more natural! Imagine dancing at sunrise on top of a gorgeous beach with your best friend. Now imagine it with your favorite music in the background! Dancing with music > dancing without music. And I can almost guarantee you're gonna do some dancing at your engagement shoot, whether it's on a mountaintop or in your kitchen making waffles. I always do my best to come to shoots with some music ready on a bluetooth speaker or just ready on my phone, which makes a shoot so much more fun! However if you like a specific genre or have a certain playlist in mind, I'm always happy to play music off the couples' phone instead. Music is a great way to tune me + the camera out so you can focus on what's most important: each other! Be ready to have a good time! Before your shoot, try to relax and do something that puts you both in good spirits - maybe grab a tasty meal or hit up your favorite coffee shop. Treat your shoot as part of a super fun date! For so many people, the only professional photos they've had taken up to this point are school yearbook photos. This will not be like that! Be open to a new, fun + memorable experience and try not to take yourself too seriously! if you enjoyed reading these tips, you’ll love my freebie, My Top 7 Tips to Rock Your Engagement Shoot! subscribe to my email list now to receive this super helpful download. Do you have trouble defining your worth by the work you create? If so, this blog post is for you. Joshua Tree is all the rage in recent years. Couples - including us - flock to this unique desert from all over the world to elope! There’s something incredible about the landscape: somehow between breaks in the barren desert beautiful things find their way through. And we’ve always been fans of a good underdog story. Having eloped ourselves, we figured we might have a unique perspective for those planning an elopement of their own - in Joshua Tree or anywhere else! In this post we’ll incorporate some shots of our own elopement process + some from a recent intimate wedding in Joshua Tree! 1. Finding an officiant: this step is one of the less glamorous parts of planning a elopement but technically the most important! If your paperwork doesn’t get filed, you didn’t elope - you just went on vacation and gave each other jewelry. In an officiant, you need someone that is highly organized, personable, available, and able to travel to your elopement spot. because we planned things pretty short notice, we weren’t able to find someone that met all of those requirements within our budget. if you can’t find one that suits your budget, style, or availability you can do what we did: go to the county courthouse! We did this in LA the day before we went to Joshua Tree, because it fit our availability, was super affordable + we were sure the paperwork would get filed correctly. Let’s Get Married by Marie : I love that she proudly claims her title as an #antiboringweddings officiant! 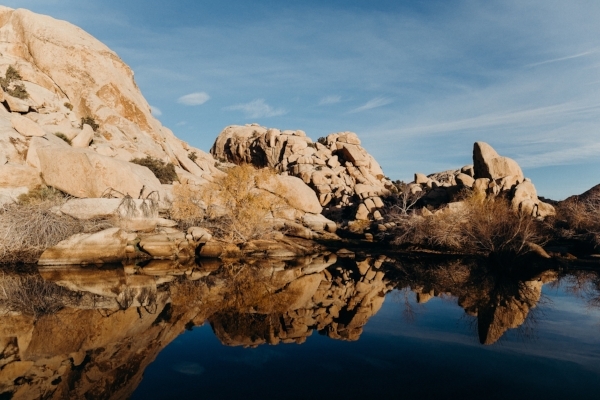 LA based, Marie offers elopement packages specifically for Joshua Tree and the Pacific Northwest. From her reviews + blogs, it’s clear that she does her due diligence when it comes to preparing for her couples! LA Wedding Woman : LA Wedding Woman offers a variety of packages to suit couples’ needs, perfect for an elopement! Wedding in the Desert : As a Joshua Tree local, Celine offers a unique perspective. She also is a certified American Sign Language interpreter, which she says has given her insight on how to “speak for” people without injecting a personal agenda. 2. Simple but significant. Eloping in a beautiful place (hi, JT) means you can really minimize costs that would have been spent on a venue (besides a park permit), decor, etc. We stayed at AirBnb’s instead of renting a hotel + wouldn’t have it any other way. cactus mountain & joshua tree house. 3. Injecting your personality. Eloping is a fun way to magnify elements of your relationship that are unlike any other! We for instance are total coffee nerds. Moments after saying “I do”, we were saying “I brew” with a French press. We picked up local coffee from Joshua Tree Coffee Company the day before for our sunrise vow exchange + joked it would be our form of a unity candle. We packed a blanket we picked up during our cross-country move the day we went to the Grand Canyon and packed it all into our little Mini Cooper (RIP) to sit on as we sipped. Another thing we like nerding out on is gardening! Hopefully we’ll have a little farm of sorts down the road, but in the meantime we love visiting plant nurseries + watching gardening shows (yes, if you’re wondering, we are actually 60 years old inside). That’s why we decided to make the bouquet an adventure too - we went to the iconic flower market downtown early Saturday morning and picked our very favorite flowers. That night, we carefully crafted a gorgeous and MASSIVE bouquet and tied it up with bakers’ twine. If you’re not down to make your own bouquet, there are several super talented florists in Joshua Tree! We loooove the bouquets from The Blooming Gypsy. Check out the hanging flower wall in this post and the wildflower-vibes here. One of our favorite photos of the whole day. This is a truly candid moment, fixing each other up one last time before heading on a short hike to the spot where we exchanged vows. 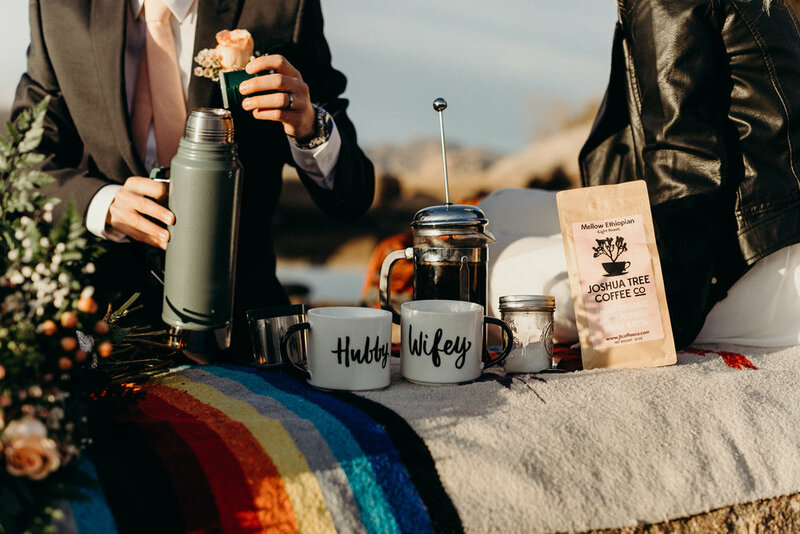 We love that it incorporates some of the most memorable parts of the day - our Mini Cooper, the homemade bouquet, and the camping pack where we’d tucked away all our coffee goods. Phone photo - In-N-Out after our courthouse ceremony! 4. Good food = good times. After leaving the courthouse from our short little ceremony, we stopped at In-N-Out, of course! And then Donut Friend in Highland Park because what wedding is complete without a little dessert? We brought fresh food & champagne down to JT and cooked in our AirBnb the night before because we love to do that together - homemade shrimp tacos + fresh guac! The next day after our ceremony, we grabbed lunch at Crossroads cafe - we had the most amazing portobello mushroom burger + we attempt to recreate it at least once every other week! Getting some of your favorite food - whether that’s Chick-Fil-A or a fancy steak dinner - will make the day feel so personalized. Maybe this is where you want to splurge, and that’s totally ok! But don’t feel pressured to. Our advice is to make sure it’s something you FEEL is worth a billion bucks, even if it doesn’t cost much. Phone photo - realizing we’re stuck in a ditch. Phone photo - realizing we can’t get out. 5. Understand that things may go wrong. Elopements aren’t immune to unpredictable moments any more than traditional weddings! We grabbed some phone photos to document this moment because we knew as ridiculous as it felt, we’d be laughing about it soon. We had wrapped up our portraits + headed back to our airbnb, and we got STUCK in the desert. Literally stuck. In the sand. Like, had to be towed out by AAA kind of stuck. The joke that day was “well it can only go up from here!” Sometimes as a photographer you walk into an intimate wedding and ten minutes later you’re sewing a grooms’ pants seam, or helping dig your couples’ car out of the sand (thanks, Vic!). We hope you enjoyed these tips for planning an intimate ceremony! Tell us in the comments if you’d like more posts like these + what tips you found useful! It's such a privilege when friends ask me to capture a time in their lives. When my good friend Jacqueline reached out to me for a shoot she was planning in San Francisco, I jumped at the chance! Jacqueline and I have known each other for years. We met while participating together on the Atlanta Student Board of the National organization AIGA. As board members we planned events, recruited students from across all over Georgia, and attended lectures together. Being able to document this special time with her + Timothy, all the way across the country from where we met, was such an honor. Jacqueline's background is in graphic design, and Timothy's is in engineering. This is the same art/engineering dynamic in my own relationship and I find so many other couples that share it too! Many people say "opposites attract," but honestly I think it's the unseen similarities that draw these types of people together. The same creativity an artist uses can be applied to a complex engineering problem, and the strong analytical mind of an engineer can be used in creating great art. After a few hours at The Legion of Honor, we headed to nearby Baker Beach. When we first arrived the Golden Gate Bridge was covered in fog, but by the time we got our feet in the sand the sky had opened up and turned into an incredibly sunny day. I had an amazing time with Jacqueline + Timothy, and I loved shooting in San Francisco! It was a breeze to fly up there - just an hour-long flight from LA, but such a totally different world. Jacqueline and Timothy were so kind, patient, and graceful with each other and I know their marriage will be a continuation of the beautiful relationship they have. I’ll be capturing Michelle + Kyle’s wedding day later this month - here are a few of my favorite shots from their Venice Beach engagement session! Whenever I talk about having eloped, I'm usually met with the same response: their eyes get big and wide, a smile leaps onto their face, and they ask lots of questions. We're celebrating six months of marriage this Saturday, so I thought it'd be the perfect time to post a few answers! Deciding to elope was a big + hard decision for sure. I've been to my share of gorgeous, traditional weddings - I mean, how else could I have gotten so interested in the world of WEDDING photography?! 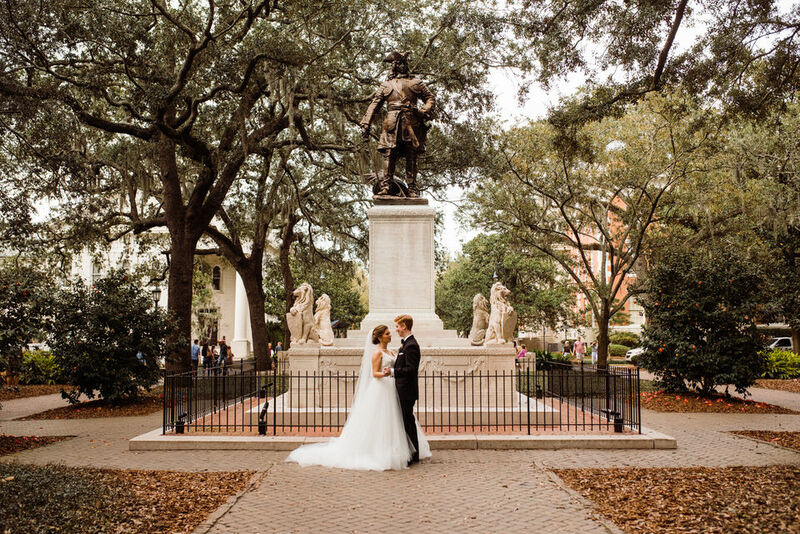 I was covered with goosebumps when my friends Tiffany and Matt exchanged vows during a Catholic ceremony, and equally so when Madison and Walt said "I do" at a 100-year-old southern home. There's absolutely nothing wrong with doing something more traditional. I believe a wedding should aim to be a reflection of your relationship. This is the very beginning of the new start in both your lives. It's a manifestation of the bonds you've built together and all you've been through. It's a bridge from where you've been to where you're going. Your wedding - and your marriage - don't have to look like any one else's. It just has to work for you two. 1. Even though we're social, we're both introverts at heart. The thought of a huge wedding seemed so out of character for us. We'll take a vegan pizza loaded with veggies + a documentary on Netflix over going out to a club any day; something that felt super high-energy would have been really straining and felt unnatural. 2. We *try* to keep things pretty minimal. We're both passionate about sustainability and try to be mindful of that whenever we can. Traditional weddings can produce a lot of waste - from the bridesmaids gowns that will never be worn again, to an exorbitant amount of leftover buffet food no one will eat. A lot of more modern approaches have made great progress in reducing this waste, but again - it just felt like it would be forced and not in line with our values. 3. As big fans of travel, nature, and national parks, we wanted to choose a location that really reflected those interests. Neither of us was excited at the thought of having a church wedding, and by eloping we avoided that entirely! We researched a lot of different parks and places. We decided to stay in California because we had just made the big adventure out west and everything was still (and is still) so exciting to explore! Joshua Tree is incredibly picturesque and not as highly trafficked in January as many other California parks, so we knew we would have a little more intimacy in that space. 4. Financially! I recently read the average U.S. wedding costs $35,000. With us both having graduated college only last year, $35k wasn't something we were itching to add to the piles of student debt laying around. When it was all said + done, our wedding cost us about $1500. He wore his best suit but bought a new tie + pocket square, I bought a dress online + had it fitted. We bought locally-roasted coffee in Joshua Tree to drink after exchanging vows and picked up way too many flowers from the Downtown Los Angeles Flower Market (did you see that bouquet? so much for minimal!). We stayed at a super cute AirBnb in the desert + spent time enjoying nature. 5. We wanted to be married already, damnit! After dating for nearly 5 years and living together for almost as long, we both knew we were in it for the long haul. We had celebrated victories and mourned losses. We worked countless busy weekend brunches at one of Atlanta's top restaurants (shout out to The General Muir), which bonds even strangers in unimaginable ways. We traveled together, helped each other make big decisions, and supported each other through it all. More than anything, we were extremely happy and ridiculously in love. The first month we were dating, I told him I'd marry him whenever he was ready. It took a little longer than I would have liked, but in the end I wouldn't change a thing. **Photo credit to the amazing Victoria Bonvicini. 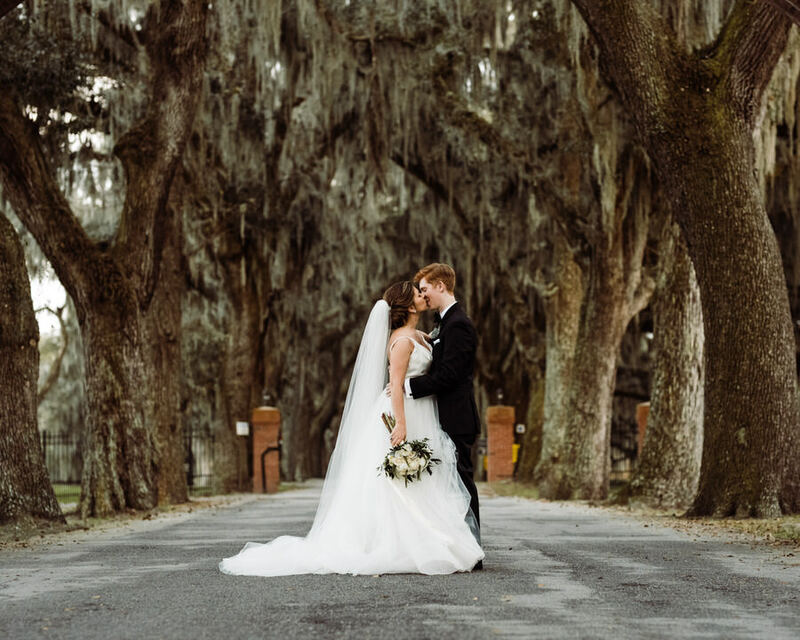 So grateful for these beautiful images that captured the day, and for the inspiration she has always served for my own journey in couples photography!